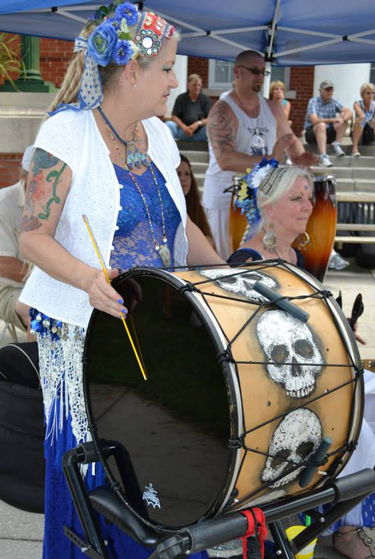 Cyndy’s love of drumming evolved from her love of dance. She was a classically trained professional ballet dancer and instructor for 20 years; after retiring from dance she had desire to take a more active part in creating music and found African drumming. Seeking out traditional and contemporary drum teachers, she has studied with many traditional masters, including Buddy Helm and Papa Malik Faye. Cyndy plays many different percussion instruments some of which include djembe, dundun, conga, doumbek and riq. You do not need any drum experience to begin classes right away! All levels welcome. A singer in high school, Paula became addicted to percussion in college, but her profession and career came first. She started drumming in her 50’s, three years after she started to dance. Purchasing her first doumbek in 2009, she found instruction in St. Petersburg, Fl with Johanna Kryzynzki. Since then, Paula has taken classes with Carmine Guida of Djinn, Darbuka Dave Machek of Brizeus, Daveed Korup of Turku and Jeremiah Soto of Solace. She continues her education as an online student of several of these teachers, including Raquy Danziger of Raquy and the Cavemen. She currently teaches basic doumbek for DanceCraft and leads live music classes during DanceCraft Level 1 tribal belly dance classes for her drum students. She also drums occasionally with the all female world fusion, JANE on doumbek, riqq, frame drum, zills, moroccan qarkabeb, and a davul named Dana Skully. No drum experience necessary to attend, just a desire to learn and have fun doing it! All levels welcome.